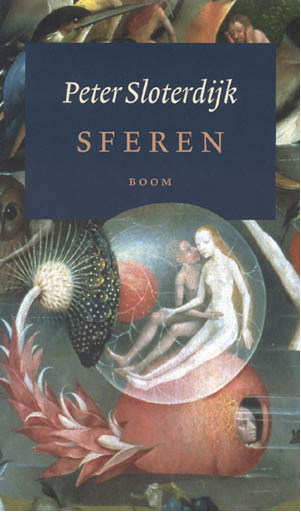 I finally hold a copy of Sferen in my hands, a Dutch translation of Spheres I and II, with a detail of two lovers in a bubble from the The Garden of Earthly Delights by Bosch on the cover. Sloterdijk first caught my attention when stumbling on his arse comments. This book had me laughing on the second page when Sloterdijk adds an imaginary plate to hang above the entrance to Plato‘s academy (the original one is “let no one destitute of geometry enter my doors.”), titled “let no man unwilling to engage in love affairs with other visitors enter my doors,” thereby filling the world with an embodied philosophy, one which does not deny Eros. This entry was posted in philosophy on August 13, 2009 by jahsonic.